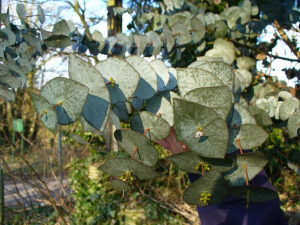 Observation - Young Eucalyptus, species unknown - UK and Ireland. Description: Fairly spindly, some stems tall and sturdier; in the tangled corner/edge of a garden, not yet escaped. Fairly spindly, some stems tall and sturdier; in the tangled corner/edge of a garden, not yet escaped.